ELM RD. candles are handmade in Kent using 100% natural and vegan friendly ingredients. 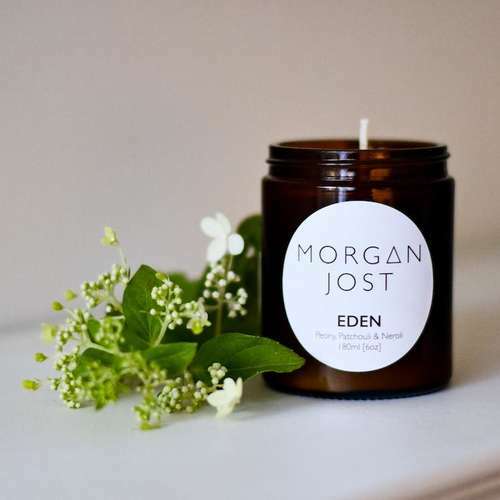 They are created with the perfect combination of rapeseed and soy wax for a clean and long-lasting burn, a wooden wick, and a special blend of pure essential oils. Freedom - Earthy tones in this scent ensure a grounding experience, sharpness of mind and a general feeling of being connected with your environment. This uplifting sense of belonging is truly an antidote to feeling isolation. It's liberating. Courage - The woody notes remind us of the first source of fuel for fire. Of the ancient wisdom inherent in trees, to provide shelter and warmth. The smoky birch tar aroma reminiscent of ancestors calling us back to our roots, leading us on a pathway to challenge our fears, to be brave and find our peace in Mother Nature. Happiness - The citrus notes in this scent are a trusted pick-me-up when feeling glum or stressed, the zesty tang encouraging vigour and life. It has been proven scientifically that citrus aromas can relieve stress and anxiety. Rosewood provides grounding heart notes, while the aromatic notes of pine and rosemary help clear the mind and lift the spirit. Intimacy - Floral notes go straight to the heart, creating a sensual and soft atmosphere. The aphrodisiac properties of rose absolute, ylang-ylang and patchouli go straight to the part of your brain that heightens your senses, and draws you closer together in an intimate moment in time. The woody frankincense notes anchor this scent, letting it gently linger around you in the air. Serenity - The warm and exotic oriental notes in this scent will revitalise your spirit and calm your mind. The tropical flowers and lemongrass provide the first impressions, and as the scent develops, you are introduced to the grounding and relaxing aromas of sandalwood and frankincense. The first type is the 60m travel candle (52mm x 55mm) which has a burn time of up to 15 hours and is stored in a glass jar with metal lid. The second type is the large 237ml tumbler candle which has a burn time of 50+ hours which is stored in a beautiful hand-blown cocktail glass with cork lid which helps to preserve the candle's aroma. Ingredients - Rapeseed and soy wax, essential oils and wood-wick. Product Packaging - Glass, metal lid (60ml)/cork lid (tumbler). ELM RD. is a natural home fragrance brand which make all their products with their very own hands, in the Kentish countryside, using only the best locally sourced ingredients. As a result, they know exactly what goes into each mist bottle and can guarantee that they are free from chemicals, additives and synthetic fragrances. Their range of candles and mist help to promote calmness in the home creating a subtle escape from our busy lives.